Persecution will test the foundation of our faith. Are we prepared? A strong faith is built on Jesus Christ and obedience to His Word. Living our lives according the words of Jesus is like building a house on a solid foundation. If we are doing that, then when persecution comes, we can stand by the grace and power of God. Matthew 7:24-25 Everyone then who hears these words of mine and does them will be like a wise man who built his house on the rock. And the rain fell, and the floods came, and the winds blew and beat on that house, but it did not fall, because it had been founded on the rock. Prior to this statement, Jesus said in the Sermon on the Mount, Matthew 5:10-12 Blessed are those who are persecuted for righteousness sake for theirs is the kingdom of heaven. Blessed are you when people insult you and persecute you and say all kinds of evil against you falsely because of Me. Rejoice and be glad, for great is your reward in heaven, for in the same way they persecuted the prophets who were before you. Persecution has come to Christians in America, but it is not the Muslims who are targeting Christians the most. It is non-believers who call evil good and good evil. To withstand this persecution, we must ask our Father to fill us with the Holy Spirit. Then we can stand, as we hear and obey the words of Jesus. The Holy Spirit will remind us of God’s Word, give us courage to obey His will, and give us grace to love our persecutors with His love. 1 Peter 4:12-16 Beloved, do not be surprised at the fiery trial when it comes upon you to test you, as though something strange were happening to you. But rejoice insofar as you share Christ’s sufferings, that you may also rejoice and be glad when his glory is revealed. If you are insulted for the name of Christ, you are blessed, because the Spirit of glory and of God rests upon you. But let none of you suffer as a murderer or a thief or an evildoer or as a meddler. Yet if anyone suffers as a Christian, let him not be ashamed, but let him glorify God in that name. How might you expect to be persecuted in America today? In some cases, it sounds like this: How dare you say that homosexuality is a sin! Well, we say it is a sin because it is the truth, and we want people to be saved. Practicing homosexuality will send us to Hell the same as adultery, fornication, and all other sin will send us to Hell. But in many places, if you speak this truth, you will be persecuted. Your bakery may be sued. Your photography business could be closed. You will be severely disciplined on your job, regardless of whether you work for the government or a private company. And if you don’t change your belief or refuse to remain silent and comply, you will be fired. Here’s a few more: How dare you fight against a woman’s right to an abortion! How dare you say that Christianity is the only true religion! Who do you think you are to say what is right or wrong? Why do you think such narrow minded and bigoted things? Why are you so hateful? Peter says, be ready to answer these questions and to give the reason for your hope, but answer with gentleness and respect! Don’t get caught up in a quarrel or fight. 1 Peter 3:14-17 But even if you should suffer for righteousness’ sake, you will be blessed. Have no fear of them, nor be troubled, but in your hearts honor Christ the Lord as holy, always being prepared to make a defense to anyone who asks you for a reason for the hope that is in you; yet do it with gentleness and respect, having a good conscience, so that, when you are slandered, those who revile your good behavior in Christ may be put to shame. For it is better to suffer for doing good, if that should be God’s will, than for doing evil. How do you handle it when someone ridicules you? Are you the type that gets angry, and shouts them down? Or are you strong enough in Christ to bless those who curse you? With the patience and love of God, can you develop a relationship with your persecutor and teach them? 2 Timothy 2:23-26 Don’t have anything to do with foolish and stupid arguments, because you know they produce quarrels. And the Lord’s servant must not quarrel; instead, he must be kind to everyone, able to teach, not resentful. Those who oppose him he must gently instruct, in the hope that God will grant them repentance leading them to a knowledge of the truth, and that they will come to their senses and escape from the trap of the devil, who has taken them captive to do his will. Acts 20:22-25 And now, compelled by the Spirit, I am going to Jerusalem, not knowing what will happen to me there. I only know that in every city the Holy Spirit warns me that prison and hardships are facing me. However, I consider my life worth nothing to me, if only I may finish the race and complete the task the Lord Jesus has given me--the task of testifying to the gospel of God’s grace. Now, I know that none of you, among whom I have gone about preaching the kingdom, will ever see me again. While Paul is in Caesarea, a prophet came and warned Paul of the trouble that awaited him in Jerusalem. All his traveling companions tried to stop him from going. Acts 21:12-13 When we heard this, we and the people there pleaded with Paul not to go up to Jerusalem. Then Paul answered, "Why are you weeping and breaking my heart? I am ready not only to be bound, but also to die in Jerusalem for the name of the Lord Jesus." Paul was prepared for persecution. How did he get that way? The Bible shows us that Paul didn’t just go to church to worship, he exercised his faith and God strengthened him. What about us, here in the DeQueen First Christian Church? 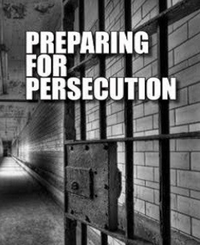 Are we afraid, or are we prepared to face persecution? Is our faith built on the Rock of Jesus Christ? 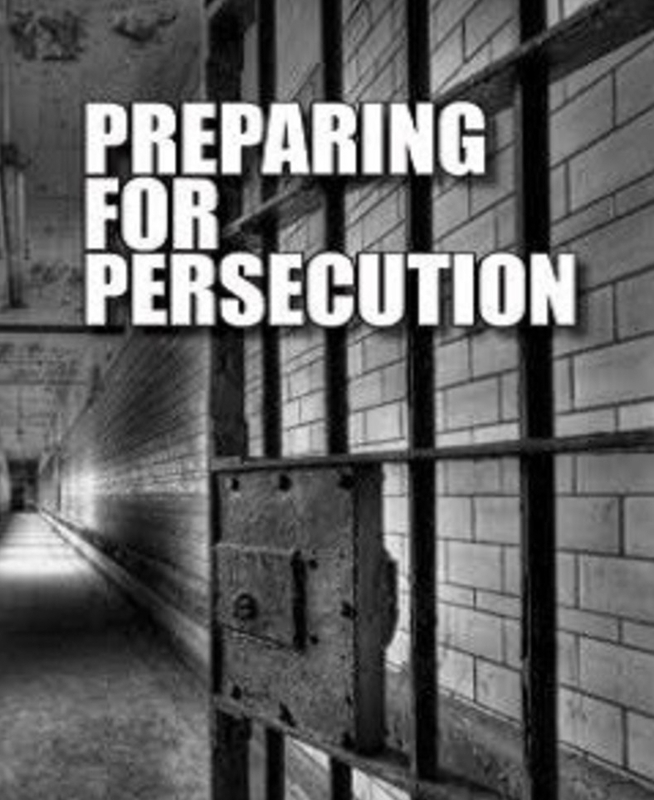 To prepare for persecution, we must not just come to church and hear the Word of God. Jesus says we must do it. So each of us must read His Word and do what He tells us to do. Encourage one another, pray with those who are struggling, and share your faith in Jesus Christ. 1. Nothing can stop the spread of the Gospel when God’s people are faithful. Those who die for their faith in Christ, give a powerful witness that they know Someone who gives eternal life. 2. We must have an intimate relationship with Jesus Christ. The church in Acts continued to preach Christ because they understood Christianity is not a set of beliefs that can be abandoned when convenient, but rather it is an expression of a relationship with Jesus Christ. Therefore, they followed Christ, whom they believed, regardless of the persecution. Today, many say they would rather die than deny God or His Son. But the truth is most already do deny Him at work, at school, and in front of friends. Following Christ isn’t something we do on weekends. It isn’t a hobby. It isn’t recreation. It isn’t part of our lives—it is all of our lives; otherwise, we are not following Christ. Christianity is an intimate relationship with Jesus, shining brightly so that all can see Christ in us. The great danger facing the American Church today is not Islam, but that it has stopped following Jesus Christ. 3. People will desire to know Christ when they see Christ living in us and working through us—especially in the midst of persecution. Therefore, Jesus said in Matthew 5:16 In the same way, let your light shine before others, so that they may see your good works and give glory to your Father who is in heaven. It has been calculated that more Christians were martyred in the 20th century than all the previous centuries combined. In the early part, the Ottoman Empire tortured and killed 2 million Armenian Christians. In the latter part, the Islamic government of Sudan killed more than 2 million Christians in southern Sudan. Millions more died in smaller groups during those years. In the United States, Canada, Germany, and other countries, the persecution by non-Islamic governments is more insidious and less publicized. For example, children have been seized by their respective Child Protection agencies because their parents are home schooling for religious reasons and therefore might have unusual beliefs regarding child rearing. Would having your children taken from you cause you to deny Christ? We can expect even greater persecution as we approach the return of our Lord. How can we prepare for it? The first way to prepare is to remember that we are blessed if we suffer for Christ. If we don’t keep this in mind, we will forget God is with us. 1 Peter 3:14 But even if you should suffer for what is right, you are blessed. 1 Peter 3:17 It is better, if it is God’s will, to suffer for doing good than for doing evil. The second way to prepare is to set up Christ as Lord of our lives. This means that Jesus Christ will rule our desires and emotions. It means that His will takes precedence over our own will. We do not want to suffer or be martyred, but our faith must develop to where we say as Jesus, "not my will, but your will be done." It also means that we will not let fear rule our hearts, for we know that persecution will not come between us and the love of Christ. The third way we can prepare for persecution is to “always be prepared to give an answer to everyone who asks you to give the reason for the hope that you have. But do this with gentleness and respect”. This does not mean that we need to be able to answer every theological or doctrinal question others might have. We should strive to know these, but that is not the point here. We should always be able to explain the basis of the hope we have. That hope is Jesus Christ. Can you tell others about Jesus? If you don’t know Him, you can’t say much about Him. Luke 12:11-12 And when they bring you before the synagogues and the rulers and the authorities, do not be anxious about how you should defend yourself or what you should say, for the Holy Spirit will teach you in that very hour what you ought to say. If Christ is in us, people will see that we have hope, peace, and joy, especially in the midst of persecution. And the Holy Spirit will cause us to share our hope with gentleness and respect; not with arrogance, thinking we are better than they are, and not with anger. The fourth way to prepare is by keeping a clear conscience. If you compromise in small matters of obedience now, you will compromise to avoid persecution when it comes. If you do not resist temptation and deny yourself now, you will succumb to temptation and deny Christ when persecution comes. A clear conscience allows us to face the threat of death without fear and trembling. We keep a clear conscience by not doing wrong and remaining holy, even when provoked. By doing this, those who speak against us, and also those who persecute us, will end up being ashamed. If not at this time, they will certainly be ashamed on the Day of Judgment. So pray for them. The fifth way to prepare for persecution is to remember the example of Christ. Christ suffered that He might bring us to God. And good can come through our suffering, especially if we suffer in a way that glorifies God. To this, we have been called. When we love Jesus with all our heart, it is an honor to suffer for our Lord. So, we need to encourage one another and keep our eyes fixed on Jesus. We will need to remind one another many times of these things as persecution intensifies. In the meantime, remember to pray for those undergoing severe persecution today. Pray that God is glorified through their persecution. Pray that their witness is seen by the world. Pray that their persecutors may experience repentance and salvation through faith in Jesus Christ. But also pray that God will deliver them so that they may no longer suffer as they do. Hebrews 13:3 Remember those in prison as if you were their fellow prisoners, and those who are mistreated as if you yourselves were suffering. One good thing persecution will accomplish is that the true Church of Christ Jesus will be separated from the false church. Unfortunately, when persecution comes, many will fall away from the faith or compromise Christ’s words and become a false church. Each of us will have to decide whether to stand with God and be judged by the world, or to stand with the world and be judged by God. Our invitation to you today is to join the true Church and to stand with God. Jesus said His Church will suffer in this world, but it is temporary. Those outside of His Church may have pleasure in this world, but they will suffer eternally. Only through faith in Jesus Christ will you have eternal life and His peace and joy in the midst of persecution. Jesus is the Way, the Truth, and the Life. If you believe that, publicly confess your faith in Jesus as the Son of God, who died on the cross to atone for your sin. Repent of your sin and give Jesus your life by dying to yourself in baptism. You will be born again of the Holy Spirit, who will give you grace to be a follower of Christ and strength to endure persecution.